Low ankle, with a ‘no show silhouette’ for anyone who doesn’t like their socks on view, Head Plain Cotton Sport Sneaker Socks are a simple solution in a soft touch cotton rich blend. 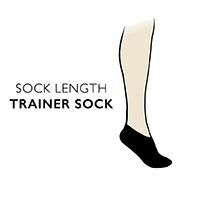 The 1x1 ribbed cuffs offer a perfect fit, allied as they are with a perfect shaped heel to keep the socks from wandering during wear. The socks in triple pack of Head Plain Cotton Sports Sneaker Socks are a non-cushioned, lightweight knit, with a flat toe seam for added comfort. A cushioned foot version is available as a crew sock.